With the No. 64 overall pick in the second round of the MLB First-Year Draft, Boston selected another prep power hitter in Nick Decker, an outfielder from Seneca High School in New Jersey. ESPN.com's Keith Law ranked him at No. 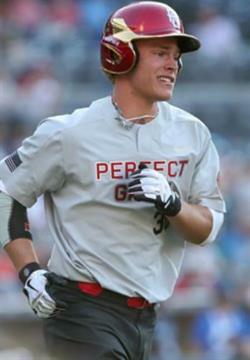 59, MLB.com had him rated as the 74th-best prospect and Baseball America slotted him No. 110. Decker is from South Jersey and is a 6-foot, 200-pound left-handed hitter, also throwing left handed. He was New Jersey's 2018 Gatorade Player of the Year, hitting .492 with seven home runs in only 59 at-bats in a shorter Northeast high school season. He was selected for the 2017 Perfect Game All-American Classic to go along with his first-team All-New England nod from Perfect Game. He is committed to Maryland. MLB.com rates his arm as his best tool with a 55 grade, but they as well as others rave about his raw power, not unlike Triston Casas, the Red Sox' first-round selection. Baseball America touts his approach as "polished" and projects him as a corner outfielder due to his ability to hit combined with the outlet being more down on his arm than MLB.com is. Fangraphs is the only publication that thinks he can play right professionally, but all agree that his bat is the key to his success professionally. 20-80 Baseball calls his swing "fluid" and it has a natural uppercut, playing into a good launch angle to drive the ball. There is also consensus that his frame offers little projection. MLB.com thinks that the raw power plays better than the hit tool, but Baseball America cites a solid swing path as one of the reasons he has the in-game ability to drive the ball over the fence. 20-80 also thinks that he can be pried away from his commitment to the Terrapins.